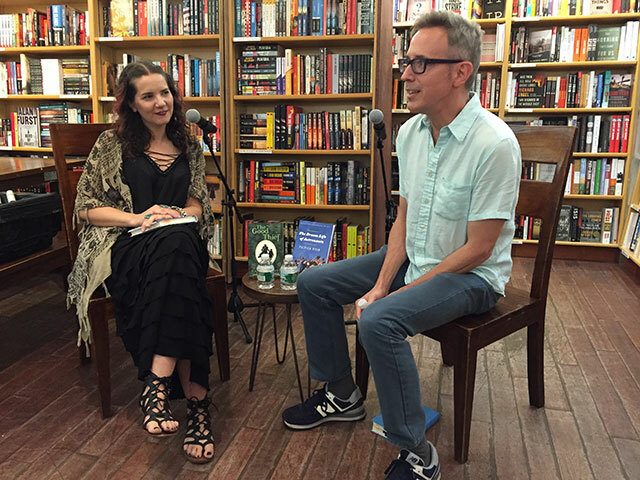 Patrick Ryan was at McNally Jackson to discuss his new story collection The Dream Life of Astronauts. He was joined by OneStory founder Hannah Tinti. The collection of stories centers around historic space moments juxtaposed against ordinary lives. Boy Scouts frequently appear. Ryan was a scout for a short time in his childhood and describes the experience as horrible. A scoutmaster lived down the street from him and the man’s sons were bullies. He includes things like the Boy Scouts in his writing because he is drawn to institutions that are set up to terrorize children. The collection is focused on life in Florida, a conscious choice Ryan made. “When you grow up in Florida, no one cares,” he says. What he means is that to be from other places often means people instantly know something about you. To be from Florida is to be nothing. Florida has no unified culture, Ryan explains, and it is something that is open to anyone. It is a true melting pot. “It’s not a non-place, damnit!” he says. One of the stories, “Go Fever,” is based on the idea that NASA could never delay any of their missions. The government had made huge investments and tell people something big was going to happen — so they had to make sure something big was going to happen even if that thing wasn’t ready. The story came about because Ryan got to thinking about what it would be like to be an employee working on a project like that. Another interesting tidbit Ryan brings up is the moon landing. NASA was fairly confident that they could land on the surface of the moon, but not so confident about getting the craft to launch again afterward. There was a speech prepared and a whole plan just in case the craft couldn’t lift off the moon. The astronauts on the moon would be allowed to speak with their families and say goodbye, and then after that all communications with earth would be cut. The astronauts would be left alone in space with no hope of recovery. They were expected to have the ability to survive for as long as thirty days. Many of Ryan’s stories are about the loss of children’s innocence, but also NASA’s innocence, Tinti explains. NASA was a huge industry in the area, Ryan explains. Everyone was employed by them and then it just slowly started to die. People stopped watching the launches, both on television and then even there in Florida. Jobs disappeared. It was the only thing the area was known for. Watching the launches as a child became routine. Even though Apollo missions weren’t always launching, other satellites like those used for weather would go up. Weather satellites, Ryan says, looked just like Apollo launches. The only reason anyone would watch was because occasionally they would blow up. It was the same reason people watch NASCAR–for the crashes. Many of the stories have a humorous edge to them. “The funniest fiction is usually not written by comics,” he says. The funniest things usually crop up by accident. The sections that Ryan thinks are hilarious often are not what people laugh at.